Why choose a Private Cloud Solution from Tech Precision? A Private Cloud Solution from Tech Precision is as close as it gets to owning your own private cloud infrastructure without the associated investment or operational challenges. We have invested in highly scalable cutting edge technology from blue chip vendors, integrated it and maintain it. And that includes network, security and backup infrastructure not just hosting. Tech Precision offers comprehensive Private Cloud Solutions that our clients can rely on, backed by our industry-leading 100% Committed Support and 100% Uptime Guarantee. We manage the infrastructure so you can get on with business. Tech Precision has carefully designed and built a core suite of services that integrate perfectly to form highly secure yet scalable solutions with a rich set of features to support the varying needs of our clients. As such we can deploy leading-edge solutions for our clients that are well aligned with their needs in a mere fraction of the time it would take to build from scratch. More importantly, our clients know that there is capacity available to them on demand to cater for ongoing growth, projects and urgent requirements. Tech Precision solutions are what is best referred to as ‘Infrastructure as a Service’ or IaaS. We have invested in hardware from vendors like Cisco, Fortinet, IBM and EMC and partnered with software vendors like VMware, Veeam and Microsoft. We also openly support the use of Linux, including both commercial free distributions. However most importantly we have designed our services such that clients can choose to self-manage elements of their solution and/or delegate such responsibilities to their partner of choice, be it their systems integrator, software developer or otherwise. The key to being able to offer Private Cloud Solutions that are reliable, secure and perform as expected is to underpin them with an Enterprise-grade private network solution. Tech Precision operates its own next-generation MPLS network with national coverage in both Australia and New Zealand. Carrier interconnects with a number of major players in each of these markets enable us to offer access services ranging from ADSL to Dark Fibre. Due to the fact that Tech Precision operates its own network we are able to provide value added services such as Tech Precision Access Protection and Tech Precision Access Bonding. When a business moves from on-premise hosting to Cloud Computing network outages are not an option. Tech Precision Access Protection leverages two discrete access services, ideally different technologies from different carriers, and enables automatic failover in the event of an outage with the primary service. The primary service might be Ethernet over Fibre at 20Mbps and the secondary service might be Ethernet over Wireless at 10Mbps. Or for a smaller requirement it might be Ethernet over Copper at 10Mbps with ADSL2+ as the secondary service. Solutions can be designed to suit the needs of any client, large or small. In locations where network access options are limited and/or options such as fibre are cost prohibitive, Tech Precision Access Bonding offers an elegant solution. Leveraging capabilities of the Tech Precision MPLS network we are able to bond up to four services to provide additional capacity. For example a key site may only qualify for 4M/512K with ADSL2+ but by bonding four services Tech Precision delivers 16M/2M. Access Bonding also enhances fault tolerance as if a given circuit fails this will simply decrease the available capacity until it is restored. For many of our clients now Internet access is mission critical. Without it their business will effectively grind to a halt. In order to ensure excellent performance and a highly reliable service for our clients, Tech Precision maintains multiple Tier-1 Internet connections and high-speed peering connections with other major service providers and content providers. Depending on each client’s requirements, Tech Precision can either deliver direct access to the Internet or secure it via Tech Precision Managed Firewall. Tech Precision Managed Firewall is built on enterprise grade security appliances from Fortinet, the world leader in Unified Threat Management (UTM). It offers clients a highly robust and extremely scalable firewall platform with a wealth of features , including IPSec and SSL remote access, anti-virus, anti-spam, content control, IPS (Intrusion Prevention System) and WAN optimisation. Connected directly to the core of the Tech Precision MPLS network, Tech Precision Managed Firewall can be tightly integrated into solutions to enable granular control and full use of the available features. Email is now an essential service for most organisations and in many cases is considered mission critical. It is important that it is available, that inboxes are not clogged with spam and that email borne viruses and malware are detected and dealt with effectively. Tech Precision Email Security is based on the feature-rich and battle proven FortiMail platform from Fortinet. Configured in gateway mode, it acts as an inbound and outbound proxy for the client’s existing mail server, enabling the FortiMail platform to assess and eliminate threats with both inbound and outbound mail before they become a problem. Businesses of all sizes are beginning to see significant appeal in cloud computing. They want to consolidate, leveraging virtualisation to generate cost efficiencies and increase business agility. Based on VMware ESXi and with VMware HA (High Availability) enabled by default, Tech Precision Virtual Server offers rapid provisioning, effectively eliminates the need to purchase expensive equipment and significantly reduces operating costs. 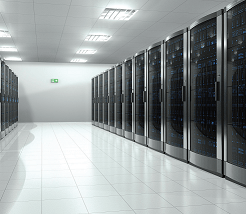 And Tech Precision Virtual Server provides the ability to scale up memory, processor and storage capacity quickly and effectively to cater for the evolving needs of our clients.